Velji Dosabhai and Sons Pvt Ltd started clearing and forwarding business the year 1925 and at present having 26 offices and associate offices all over India. 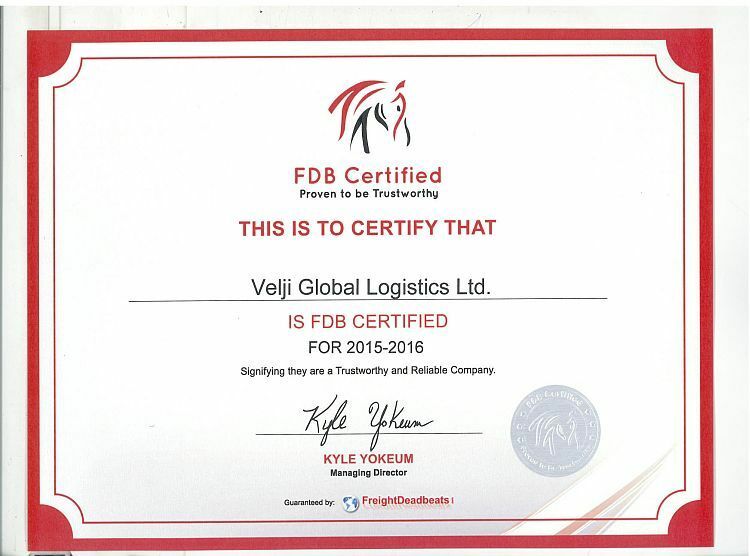 VGL has become a FDB-certified company. Velji Global Logistics specializes in handling of cargo and offering logistic solutions to worldwide destinations using our own networks. We seek to distinguish ourselves by providing world class cargo handling services be it FCL, LCL, Air Freight, Vehicles or Break-Bulk Cargo, Project/over sized shipments and Custom clearance and door delivery. Our global agency network enables clients to benefit from freight packages tailored to their individual needs and time requirements. Efficiency in communication management through use of EDI (Electronic Data Interchange) -We have one of the strongest global freight and logistics management. Connecting LCL cargo worldwide through our main hubs in Dubai, Nhava Sheva and Singapore. In a relatively short period VGL had established a decent loyal client base due to our high quality services standards. We are offering value added services like instant response, information flow, shipment advice from the day we collect shipment from origin. Every staff member in VGL has contributed towards quality and growth of VGL; we keep increasing the quality of our services all the time.